Shoshana Thompson is 26 years old, miles from home, and engaged to be married into one of Washington D.C.’s wealthiest families. Andrew Walsh, her fiancé, is Shoshana’s vision of the perfect man. Throughout their engagement, she becomes enamored with his privileged lifestyle. While Shoshana navigates the tricky world of in-laws and societal wedding planning, she desperately tries to ignore her growing feelings for another man. She knows that exploring this love will threaten her existence as a Walsh. But, when she discovers the feelings may not be one-sided, she knows things are about to get a lot more complicated, especially because this man is absolutely off-limits. Becoming Mrs. Walsh is a story of relationships and the richly layered complexity of family, in-laws, and love. It was easy to dive right into “Becoming Mrs. Walsh.” I wanted to see if Shoshana’s character could handle what it takes to be a member of the well-known Walsh Family. They come from money, so it’s naturally that they have the best designer clothes to extravagant china and silverware and spur-of-the-moment trips — they have it all. I was curious to see how the women of the family compared to the evil step-sisters in Cinderella, which led me to sympathize with Shoshana before any evilness began. The Walsh women, Zoe, Ariel, Rachel, weren’t what I expected. Were they critical, judgmental at times and overbearing? Yes, but I didn’t think that any of what they said and/or did was intentional. I think it was more Shoshana’s insecurity and image of what a wealthy family thinks of someone with an opposite number in their bank account. One thing I really liked and appreciated from the author was that Shoshana wasn’t ridiculed for not knowing what or how to do something — at least from the reader’s POV. As for her fiancé, Andrew, I really disliked him and sometimes wanted to ask Shoshana what she was thinking by just going along with his secretive job, one even she can’t know much about. Andrew might look good on paper, but he didn’t in this book, but it made me see how easy it was for her to fall for someone else. In the end, and with a lot of ups and downs, Shoshana seems to settle for a type of happiness that only money — not love — can buy. I felt sorry for her because I knew she wasn’t truly happy, but understood why she decided to settle…until the ending! From out of nowhere, came something horrifying/shocking/exciting! I wasn’t left satisfied with the ending at all, so for a couple of nights while trying to fall asleep, I thought about Shoshana’s story and wondered if she was happy. This is why I’m beyond excited to tell you that there will be a sequel to “Becoming Mrs. Walsh!” Shoshana’s happily ever after isn’t over! The only part of the book that I didn’t like was that Shoshana was often times referred to as “Sho.” Many times, I confused the word “Sho” with “she,” but since the story was very well-written, I looked passed that. Jessica Gordon has written a laugh-out-loud, heartwarming book about a woman who’s looking for her happy-ending and I can’t wait to read more book by the talented author, Jessica Gordon! I’d recommend this book to anyone who’s engaged, married or is in the mood for a quick read, with to-be-continued ending. They say to not judge a book by its cover, but when I saw the cover of “Becoming Mrs. Walsh” I couldn’t help but want to read it. I loved the blue background and, of course, the gorgeous ring, so I was really hoping that this book lived up to the cover that I liked. “Becoming Mrs. Walsh” exceeded my expectations! 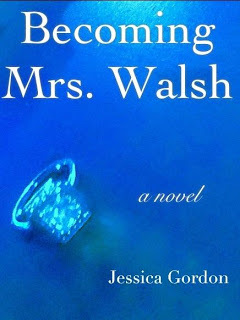 I give “Becoming Mrs. Walsh” 5 out of 5 stars! **About the author: Jessica Gordon is a Johns Hopkins University alumna for both her undergraduate and graduate degrees. She received her bachelor’s degree in liberal arts from the Writing Seminars program and her master’s degree in communications. After working in the corporate world for several years, Jessica decided to return to her first love: creative writing. Jessica takes her readers to the prominent Washington, D.C. area where her characters navigate through the complex world of family, in-laws, and love. Jessica lives in Washington, D.C. with her husband. This is her first novel. For more information on the book, check out www.jessica-gordon.com. Jessica can be reached at any time: jessica@jessica-gordon.com. Sounds like an interesting premise and it is a striking cover! Know about the sequel I might give book 1 a chance!! I will be biting my nails until that sequel is out! I loved this book. Great review! Thanks for all of the great feedback! I am so glad that everyone is liking the book. Isabella, thanks for your thoughtful review!! I really enjoyed reading it.